Give your bathroom a dose of coastal beauty with the Grayson Curved Vanity Sink. 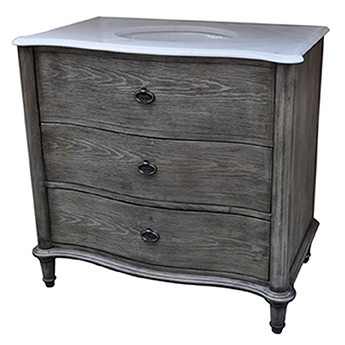 This vanity sink features a curvy, yet simple design in a weathered gray finish. Ships from the manufacturer. Allow 1 to 2 weeks. Cannot express ship this beach style furniture. For many more options, we ask you to take the time to look at our extensive variety of beach style cabinets at Bella Coastal Decor now.